Sebastian Samartano, a 95-year-old parishioner of Holy Family, Staten Island, is escorted by his sons Salvatore and Joseph to meet Cardinal Dolan, who gave him a set of rosary beads blessed by Pope Francis and a crystal crucifix. Middle, girls from the Daughters of the Immaculate Heart of Mary, a parish ministry, sing Salve Maria. Far right, Auxiliary Bishop John O’Hara, Cardinal Dolan, Father Angelo Micciulla, the pastor of Holy Family, and Father Anthony Enyinful, parochial vicar, gather in the sanctuary during the anniversary Mass on Oct. 22. Near right, Cardinal Dolan holds a relic of St. John Paul II, which he placed on the altar for the Mass. Cardinal Dolan holds a relic of St. John Paul II, which he placed on the altar for the Mass. Girls from the Daughters of the Immaculate Heart of Mary, a parish ministry, sing Salve Maria. Auxiliary Bishop John O’Hara, Cardinal Dolan, Father Angelo Micciulla, the pastor of Holy Family, and Father Anthony Enyinful, parochial vicar, gather in the sanctuary during the anniversary Mass on Oct. 22. Holy Family parishioners were presented with the unexpected, turning their jubilee into an extraordinary celebration. The parish, located in the Westerleigh section of Staten Island, celebrated its 50th anniversary with a Mass offered by Cardinal Dolan on Oct. 22, followed by a dinner-dance at the parish. 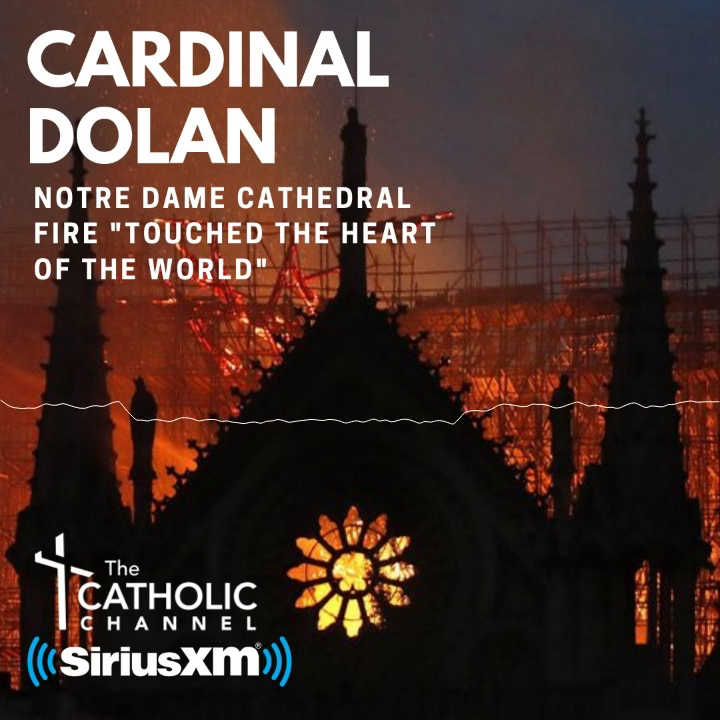 “Having Cardinal Dolan come here was wonderful. It was a great joy for the parishioners, and it was his first time at Holy Family,” said Father Angelo J. Micciulla, a native of Staten Island and pastor at the 1,500-family parish for just over a year. Cardinal Dolan opened Mass by placing a relic of St. John Paul II on the altar to mark his feast day. The cardinal’s vestments were the same as he wore during Pope Francis’ Mass at Madison Square Garden last year. At the end of Mass, Cardinal Dolan presented a crystal crucifix to Holy Family parishioner Sebastian Samartano, 95, for his “years of faithful dedication as senior altar server.” Samartano, a World War II veteran, grew up an altar server and took on the role again when he moved to Staten Island 13 years ago and noticed there were no altar servers at Holy Family Masses. Cardinal Dolan also gave Samartano rosary beads blessed by Pope Francis. “It was a very emotional and moving time for him. He didn’t know about this,” said Samartano’s daughter, Annette Cipriani, a parishioner at St. Clare’s on Staten Island. “He’s a very spiritual and holy man. He was always active in the parish when we were children. He’s a man with a lot of faith and he’s passed it on to his children. Cardinal Francis Spellman established Holy Family parish, and Msgr. Francis J. Glynn served as its first pastor. It was formed from portions of St. Rita’s, Blessed Sacrament, St. Roch’s and Our Lady of Pity parishes in 1966. Masses were offered at All Saints Episcopal Church and the new rectory at Holy Family before the completion of a parish center in 1968 on land donated by St. Rita’s. Cardinal Terence Cooke dedicated the parish center the next year. The Sisters of Charity began a religious education program in 1967 before the Dominican Sisters of Sparkill assumed leadership in 1974. In 1985, a growing parish with 2,500 families received approval from the archdiocese to build the parish’s first church, estimated to cost $2.5 million. The archdiocese promised a maximum loan of $1.5 million, with the balance to be raised by the parish. Parishioners surpassed their goal of raising $1.1 million. Cardinal O’Connor dedicated the 500-seat church, which was built on parish property, on Jan. 14, 1990. A number of parish programs and activities were developed, including a parish council and parish societies like Daughters of the Immaculate Heart of Mary, Holy Name Society and one for senior citizens. There are 250 children involved in the CYO basketball program and 230 children registered in the religious education program, which is directed by Susan Ganschow. Serving with Father Micciulla are Father Anthony Enyinful, parochial vicar, and Father James Mayzik, S.J., Sunday associate. Father Micciulla said he hopes to expand the opportunities for children in the parish by starting a youth group for teenagers.